One of the things I mentioned in the post about my New Year’s goals / intentions, was to push myself a little more in the kitchen this year. (Before pushing myself out of the kitchen for awhile while the RENOVATION is going on.) I’m feeling more confident in my amateur skills related to baking and meal-making, and I’m in a constant state of mental note-making on how the new kitchen can work to support those roles and accommodate more people comfortably. I’m not going to lie – I enjoy the solitude of the kitchen quite a bit, but I also really like it when everyone is participating. So what I’m really ready for is stations! I’m trying to build my skills a little more, and I’m also trying to push myself further at the basic ingredient level. We’re most certainly not a whole foods kitchen – we’re a fairly “unprocessed” kitchen, but if we’re making dinner that includes bread, we purchase the bread, we don’t make it. I’m also realistic about time – and I don’t have lofty goals of scratch-made everything. But there are simple ways to make better use of the ingredients we have on hand that will also improve the flavors of the finished product. I took that first photo after finishing up dinner prep one night. I do all of my prep on an 18″ wide countertop between the range and the sink. Now that I think of it – it might actually just be 15″. Whatever, it’s small. I chop everything and as I’m doing that I sweep the scraps off the cutting board and into this colander that I place in the sink. When I’m completely done with prep, I carry the scraps to the garbage can and dump them. If I had the time (and yard) for a garden, I’d most certainly compost everything, but for now, this is all just waste. 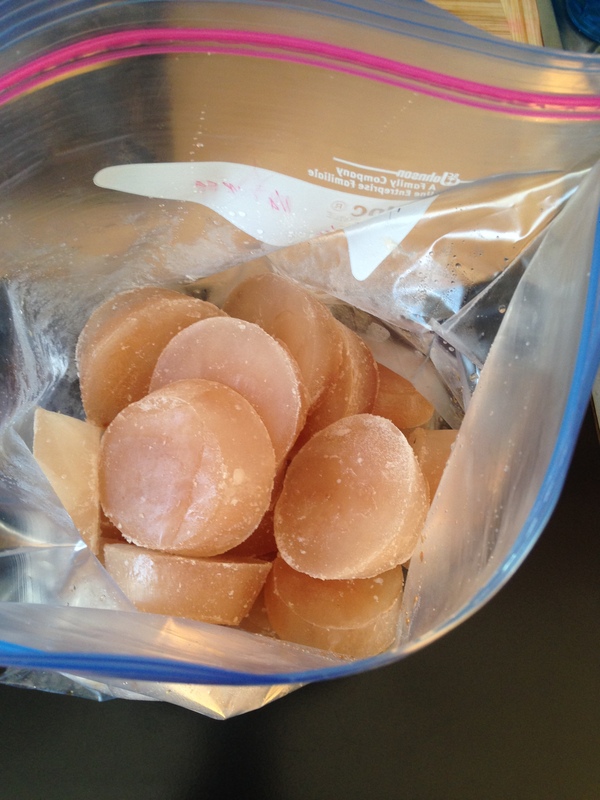 I decided I’d start a freezer bag for these throw-aways, and then I’d make my own veggie broth. I found a handy list of what to include / not include, and now I divide up my ingredients I’m prepping into two piles. I chop up the ‘include’ ingredients first, and throw those into the freezer bag, then I toss the rest. Turns out we generate a LOT of scraps each week. So I now have enough vegetable broth to feed the planet. 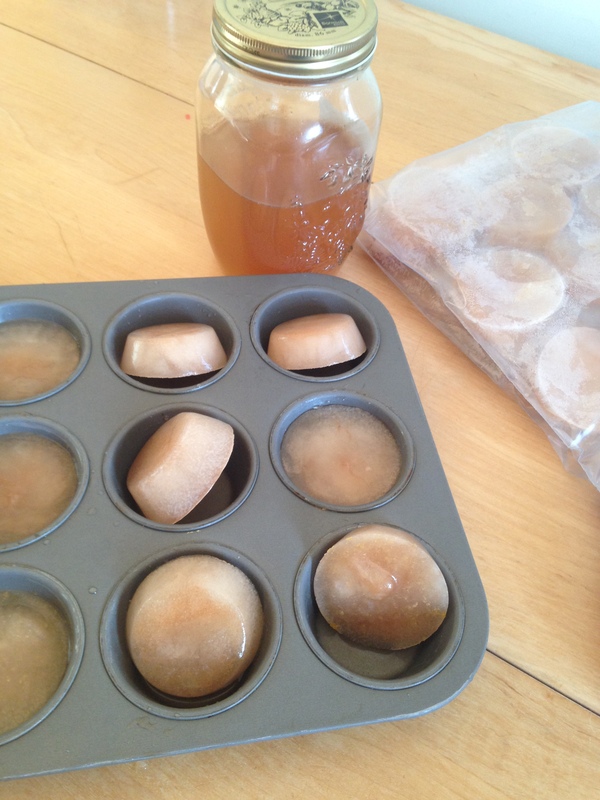 After simmering and straining (and cooling), I filled muffin tins with a 1/4 cup of broth each and froze them. I did this in several shifts throughout the day and evening Saturday. 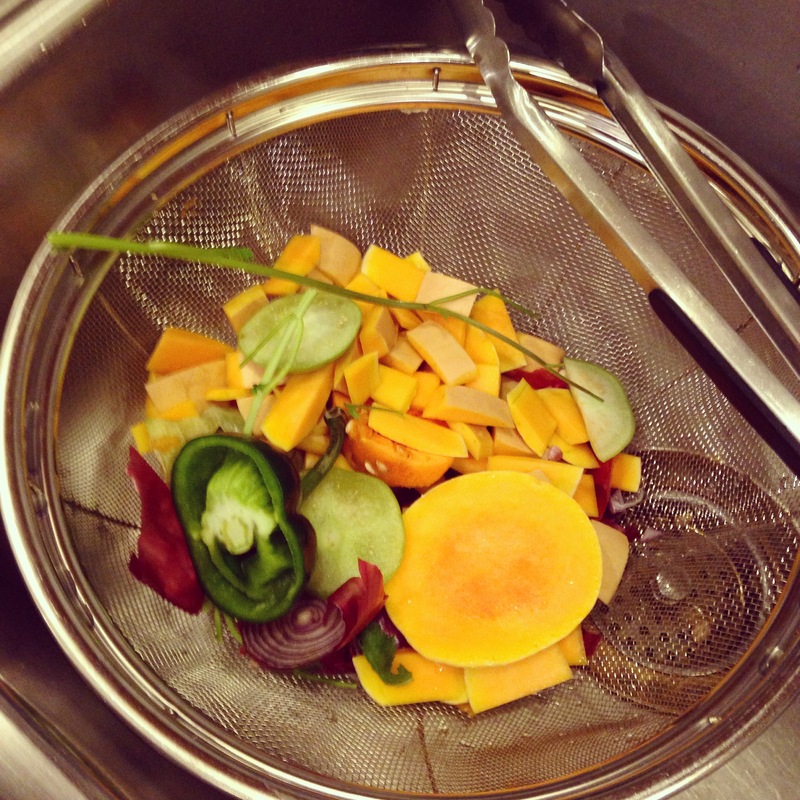 It reminded me of my baby food making days – they seem like forever ago. And now I’ve got ready to use, easy to measure, veggie broth at hand. I used the first bit to make the Saffron Rice in this recipe. I highly recommend this dish, especially on these cold, snowy evenings. And most especially when your (veggie broth) cup runneth over. I’m curious what sort of pantry staples you make. We don’t buy salad dressing anymore, and I’d like to make more of our extracts.